The mission of the Cultural Center Project is to promote the social, cultural, and economic survival of Seattle Washington’s aboriginal Duwamish Tribe. Through the collective collaboration of tribal members and the community, today, we seek to reclaim a space to revitalize our culture and preserve our living heritage. Together with our allied partners, we have built the Duwamish Longhouse and Cultural Center (DLCC) overlooking the Duwamish River Valley, near the village called hah-AH-poos, a major archeological site known as Duwamish Site No. 1. The Center’s proximity to this significant site, which is on the National Register of Historic Places, offers a rare opportunity to display never before seen artifacts and to create interpretive exhibits and tours to maximize its cultural and recreational public use. Duwamish Tribal Services contracted with Byron Barnes, of Potlatch Architects, to provide architectural services for the proposed facility. With the architect's guidance, tribal members decided the facility should reflect historic Duwamish cultural and aesthetic traditions. Original art and some designs feature the work of Potlatch Architects Partner Art Petersen. The central part of the facility is the Longhouse consisting of traditional Salish design elements with cedar post and beam structure. The main room in the Longhouse will be large enough to accommodate 200 visitors. * Traditional longhouses had partitions that enabled residents to adjust spaces as needed. Our main room is designed with that flexibility in mind. Will welcome visitors from either the west or east entrances, large, carved cedar logs will be utilized for the post beam structure, which will be two stories high. A skylight above this area will bring in daylight and moonlight. * To the east, visitors will be able to see the Duwamish River and site of two ancient villages: Ha-Ah’-poos (“Where there are Horse Clams”) and Tohl-ahl-too (“Herring House”). As tribal members and visitors step inside the longhouse, they will enter a ceremonial Duwamish space. * When we enter the longhouse, we say our Indian names and speak the names of our ancestors. The first room visitors enter honors this practice incorporating Lushootseed and established Duwamish cultural protocol. To honor our ancestors and leaders, our welcoming space will also blend the past with the present by featuring the names and representations of our tribal leaders, an unbroken, stable lineage going back more than a century. Our lobby displays archeological materials from Duwamish Site #1. The treasures from this collection have not been thoroughly curated and interpreted by scholars since the initial archeological report in 1981, but they will have a new home at our Center. The Burke Museum at the University of Washington has been holding our material culture in trust until we have a safe and secure place to display them. We are working closely with George F. MacDonald, Director of the Burke Museum, and Dr. James Nason, the museum's Curator of Pacific and American Ethnology on the design of our new facility. Then we can accept these sacred fragments of our past and make them available to our members, visiting scholars and researchers. 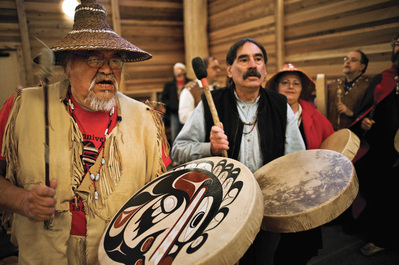 Dr. Kenneth Tollefson, professor emeritus of Anthropology, has devoted three decades of his life to documenting the history and living culture of Duwamish people. Our archive will house his professional life's work on the Duwamish, including photographs, interviews and field notes. Jay Miller, Ph.D., author of Lushootseed Culture and the Shamanic Odyssey among other books, specializes in linguistics and coastal Salish people. He will help oversee our acquisitions. Our Duwamish archives will be an essential resource for researchers, students and teachers seeking information about our language and the Seattle area prior to settlement. We will have Lushootseed CD-ROMs here for self-directed learners. We expect the Resource Center will be a magnet for scholars where we gather together primary oral histories and archival recordings, videotapes and audiotapes recorded by Jon Lee Joseph, M.A., and B. J. Bullert, Ph.D. from their oral history projects. New research based on recent archeological data will likely unlock some of the mysteries of pre-contact Duwamish life, and generate more questions for researchers. Food brings people together, and meals reinforce community. 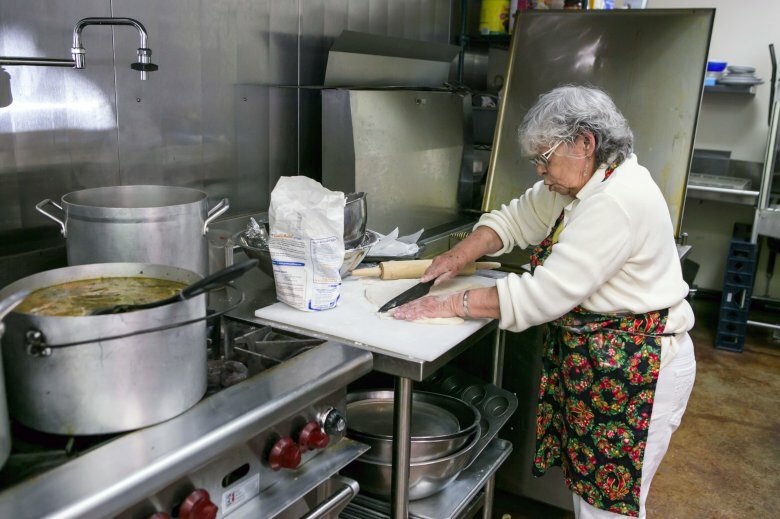 Traditional Duwamish meals are part of the revitalization of our culture and identity. We use our kitchen and cooking talents to support our facility and programs, showcasing Duwamish cooking, hosting community events, and teaching about food sustainability through our heritage programs. Traditionally, Duwamish people have adapted to a changing environment, and the food served may reflect this by mixing traditional foods with contemporary ones, giving birth to a new Duwamish cuisine. The Duwamish Longhouse and Cultural Center (DLCC) project began in the 1990s with our partners from the community helping us towards our goal of reclaiming land within our ancestral territory. The hallmark of the DLCC project is inclusiveness. Our tribal members served on boards, environmental committees, and took a leadership role in community planning efforts. The broad based community support for the DLCC was the result of decades of collaboration. Our collaborative process involved 36 community groups, several branches of government including the Washington State Department of National Resources, the Department of Fish and Wildlife and the Washington State Tourism office. Citizens, local government representatives, tribal members, and community leaders met weekly over a 6 year period to develop the concensus plan for a historic corridor along the Duwamish river. The Seattle City Council adopted the Alki/Harbor/Duwamish Corridor Plan in December 1997 to guide future development of the corridor. The Duwamish Longhouse was the final major component crowning this vision. With the “Birthplace of Seattle” Log House Museum at one end, and the Duwamish Longhouse and Cultural Center at the other, we have created a destination where visitors can experience on site the authentic Native American and pioneer heritage. The Duwamish Longhouse and Cultural Center is located on the west side of West Marginal Way in West Seattle overlooking the Duwamish River valley near a village site where the young Chief Seattle grew up. Our Center is across the street from a major archeological site, Duwamish Site No. 1 (45-KI-23), a designated site in the National Register of Historic Places. Archeologists have uncovered a major village dated back to 600 A.D. It was occupied during the fall, winter and early spring and was known for a gathering place for shellfish from the tide flats of the original Duwamish River. Shell middens along the riverbanks are still visible: This is the only remaining stretch of the original Duwamish River. Tribal Elders in 1927 called the village Ha-AH-poos, had its own shaman (healer) several longhouses, and hundreds of inhabitants that lived there in the 1800’s. Directly north of Ha AH-poos is another major former village, Tul a’lt, or Herrings House, now Herrings House Park. This large village consisted of four medium sized longhouses (100 ft x 50 ft) and a larger potlatch house more than 300 feet long. The Center’s proximity to this significant site offers a rare opportunity to open up to the public several walking tours and exhibits each with an emphasis on geology, archeology, anthropology, religion, literature and history. The Seattle Parks Department, Port of Seattle and many grassroots community and Naturalist groups such as Duwamish Alive Coalition welcome our plans to provide more comprehensive, integrated network of interpretive signs for both neighboring sites. The Port of Seattle has protected the site as T107 Duwamish Public Access Park for public access. The Parks department is restoring the wetlands and planting native plants. This has enhanced the sites educational potential for students, visitors and tourists.